I rescued this gorgeous Euphorbia from a holiday cottage I stayed in last year. The mother plant was in the border and this was a self-seeded child that was making its home in the middle of the patio. Since it wasn’t likely to be long for the world left to its own devices I extracted it, took it home and grew it on. It has rewarded me with a fantastic display this year, a ‘weed’ redeemed! This picture was taken on Sunday when it was brighter and warmer but I figured I could do with something colourful after cycling to town and back in the rain today for a meeting. 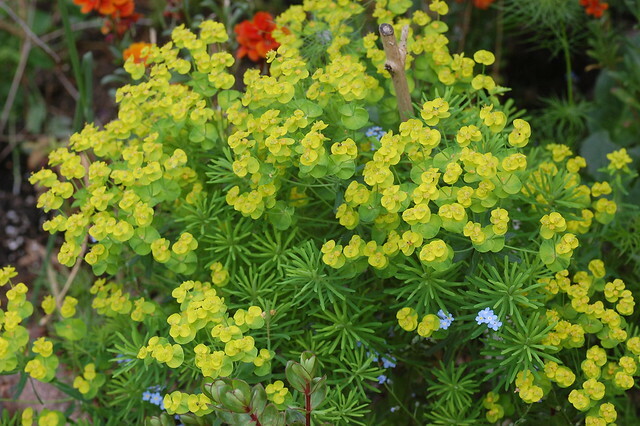 If any of you readers are Euphorbia experts, I’d welcome any suggestions at identifying it more precisely – ignore the blue flowers, which are just Forget-me-not cosying up!